Geoffrey Kromer – Geoff was raised in Putnam Lodge #46 in Connecticut in September of 1994. His career as a Massachusetts Mason officially began in 2002, when he affiliated with Caleb Butler Lodge in Ayer. 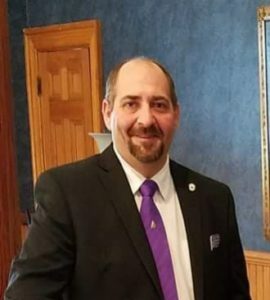 Geoff has since affiliated with 5 additional Massachusetts lodges – Frank W. Thompson Lodge (Bedford), The Scouters Lodge (Holden), Washington Lodge (Lexington), Tahattawan Lodge (Littleton), and Winslow Lewis Lodge (Boston). He served as Worshipful Master of Caleb Butler Lodge from September of 2006 until September of 2007. In December of that same year, he began serving as the District Awareness Officer for the 14th Masonic District; in June of 2008, he also took over as the Worshipful Master of the 14th District Lodge of Instruction – a position he held for one year. Geoff was then appointed by M.W. Roger W. Pageau to serve as Junior Grand Deacon for the 2009 Masonic year. After that, he became District Grand Marshal for the 14th Masonic District in 2010, and rose to the rank of District Deputy Grand Master for 2011 and 2012 thanks to an appointment by M.W. Richard J. Stewart. 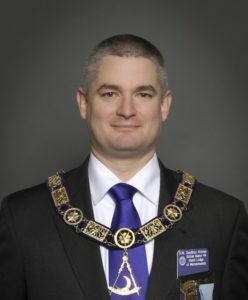 Geoff was elected to the Grand Lodge Board of Directors for a term that expires in 2020 in December of 2017. In all this time, he has not forgotten about his blue lodges – Geoff has been very involved with each of his affiliated Lodges, and has held several positions during all the time mentioned above he was working on behalf of his District and the Grand Lodge. Geoff is a member of the Scottish Rite in the Valley of Boston, where he has served as Captain of the Consistory Guard since 2015. He also belongs to Saint Paul’s Chapter, Boston Council, and Boston Commandery #2 under the York Rite. He is also a member of the Aleppo Shrine Temple in Wilmington. Geoff and his wife Nicole live in Groton, and have two young children. Outside of the fraternity, Geoff works as a Guidance Counselor for Dracut High School in Dracut, MA. David J. Raymond – David was raised in Zetland Lodge (Cambridge) on April 14th, 1993. He’s been very generous with his time and talents for twenty-four years as a Master Mason; David is a member of Scimitar Lodge (Wilmington), Mount Olivet Lodge (Cambridge), Golden Rule Lodge (Wakefield), and Converse Lodge (Melrose) in addition to (now) Lynnfield-Zetland Lodge in Wakefield. David first served as Worshipful Master of Zetland Lodge from September of 1997 until September of 1999. He also was Worshipful Master of Mount Olivet Lodge (Cambridge) from September of 1998 until September of 1999. He had a second stint as Master of Mount Olivet Lodge from September of 2003 until September of 2004. Most recently, he served as Master of Scimitar Lodge from September of 2016 until September of 2017. David was appointed by M.W. Jeffrey B. Hodgdon to serve as the District Deputy Grand Master for the Lodges in the 13th Masonic District for 2006 and 2007. David is a member of the Aleppo Shrine Temple, where he served as the Illustrious Potentate in 2015. He is a member of Tabernacle Chapter, Orient Council, and Boston Commandery #2 under the York Rite. David has three adult children. He lives in Saugus with his wife Robin. Outside of the fraternity, he works as an outside sales & service estimator for Williamson New England Electric Motor & Pump Service in Chelsea.